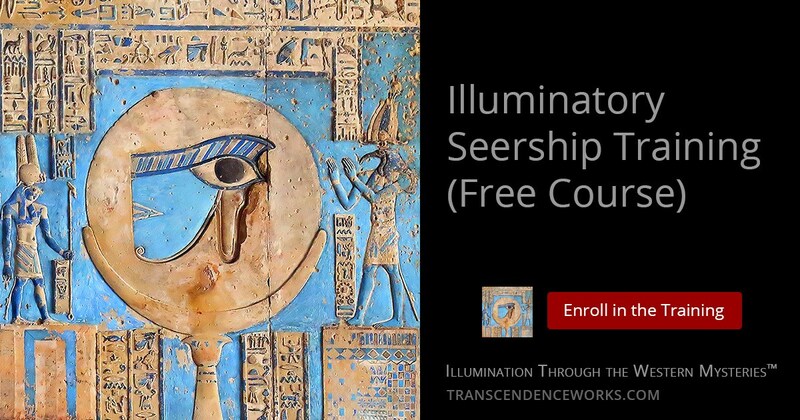 Illuminatory Seership Training | Transcendence Works! This particular form of Seership opens spiritual vision in a very deep way, and results in the quickenings and visual crystallizations that accompany the raising of the Dragon, the Western term for what is called Kundalini in the East. The light of that pure evolutionary force is literally Illumination. Illuminatory Seership is about more than just developing second sight, or opening spiritual vision, which it does—in a powerful way. Illuminatory Seership is part of an ancient lineage of practice within the Western Mysteries that offers a serious foundational pathway into Deep Initiatory Magic. The practice seems simple on the surface, yet it is quite powerful in results. It is not necessary to take my word for it, as we have students across the globe who have undertaken the work and who have shared their progress and direct experience along their journeys through the benchmark experiences of the practice. Those who do this practice go through a series of direct experiences that begin with morphing and develop into quickenings… which are raisings of pure evolutionary and illuminatory force; known in magical initiatory traditions of the West as the Dragon, and in the East as Kundalini. The culminating benchmark of doing the practice is the direct experience of an external crystallization beyond anything most of those in the magical community ever experience. This training is a part of the 3° Specularis grade of Ordo Aethyrium curriculum, which we offer for FREE as part of our Open Seership Project to those within the Western esotericism community that wish to have direct experience of an ancient Deep Magic that will prove beyond all doubt that legends of magic mirrors are absolutely true, if one has the courage to do the work. At an early age in my magical journey I was fortunate enough to see the powerful phenomena of Deep Magic—the kind of magic that is the stuff of legends. Because of that, I have a very high bar for what I consider worthwhile and real within the realm of effective magical practice and study. Those who make the effort and succeed in Illuminatory Seership work will be afforded an entirely new paradigm within the realm of Deep Magic. So… Dare to do, and see it through! The length of time it takes to get through a range of quickenings and externalizations is unique to each individual. Continued instruction accelerates the process by making sure students are focused solely on what is productive to reach the goal of repeated crystallizations that have psycho-spiritual initiatory effects, which in turn prepare students to proceed effectively into deeper levels of the work. The first level of Seership Training is often about 90 days, but can be longer. Some have their first quickenings and crystallizations around the 21-day mark, but everyone is unique and at a different level of spiritual consciousness. The process works best when practiced daily, as the results compound over time with regular practice. There are times when it may be impossible to practice every single day without interruption. Life happens, but skipping days should not become habit or it will prolong the amount of time it takes to achieve the first goal. Students are expected to keep a log (brief notes) of their practice that will be turned in periodically during sessions. Fair Warning: You WILL see things. Some of them will be very different from what you may expect. This is a very normal part of the process. This is real training in the initiatory arts. It can be intense. Do not enroll in this training if you are normally satisfied with non-phenomenal results, or if you are going to run away the first time something REAL actually happens. Approach to the Mysteries is not for the faint of heart, or for those without courage and fortitude. Live training sessions are held weekly specifically to help those working this process to share experience and get insight and support to stay the course through this very rewarding practice. In addition to the overall general requirements for private training, there are some specific individual requirements for entry into seership work due to the nature of the process. Must not have severe heart issues. Should have a private place to practice without interruption. Must agree not to attempt to teach the process learned here to others. There is normally a cost for this training, but it is being offered for FREE as part of the Open Seership Project™ created by Aethyrius. The training course itself is accessed through this page. After going through the signup process, simply return back to this page while you are LOGGED IN to your account to access the modules below.